Discussion in 'SFNE Discussion' started by DylanBIZARRO, Mar 3, 2017. Are you hyped for 2017?! 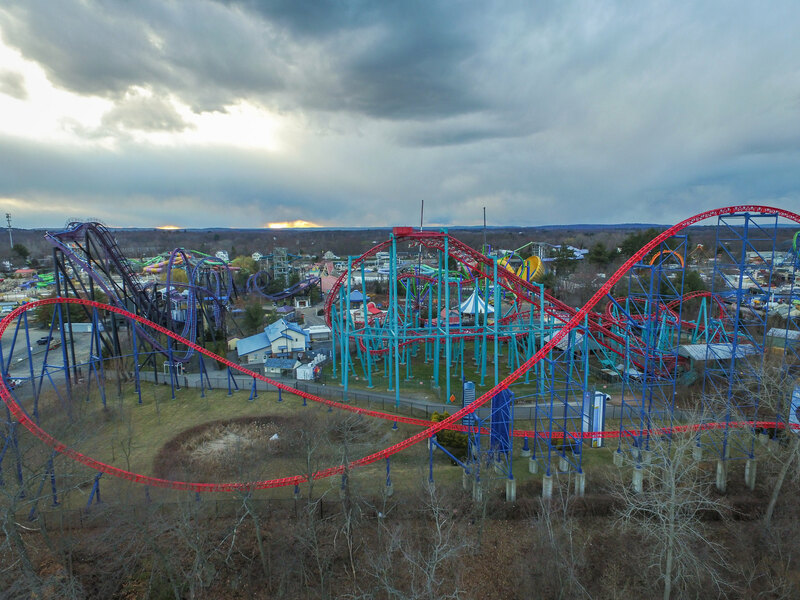 DISCLAIMER: I DID NOT FLY OVER SIX FLAGS PROPERTY. PLEASE TRY TO KEEP THESE PHOTOS ON THE SITE. I HAVE BEEN TOLD TO TRY AND KEEP THE PHOTOS OFF SOCIAL MEDIA, SO PLEASE, IF YOU WANT ME TO KEEP DOING THESE UPDATES, DO NOT POST THEM ON SOCIAL MEDIA!! 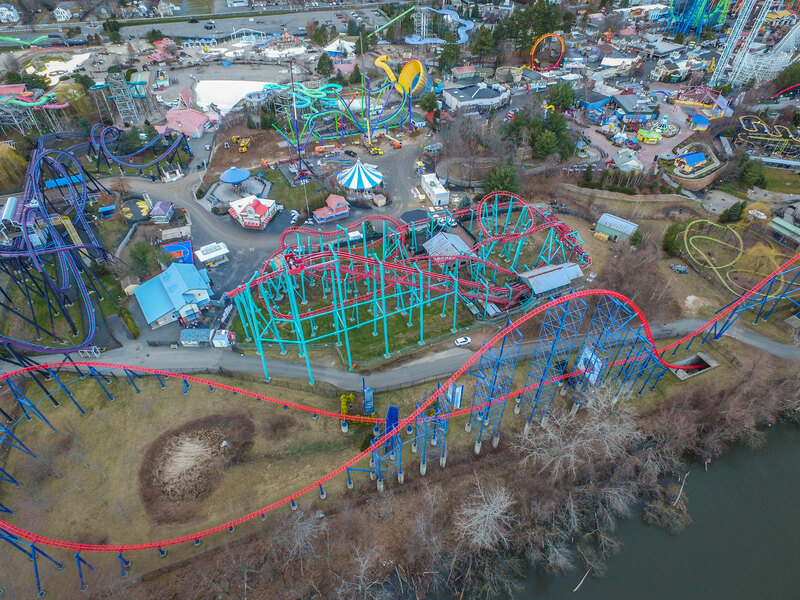 So today on the way somewhere I stopped at the end of the road near Batman and flew my drone around the park to see the progress in the park. The first thing I heard when I got out of the car (Besides a flat tire ) is the construction noises coming from the park. They were defiantly working today. I then heard the buzzer noise that comes from Mind Eraser when they usually reset the ride or whatever when it breaks down. 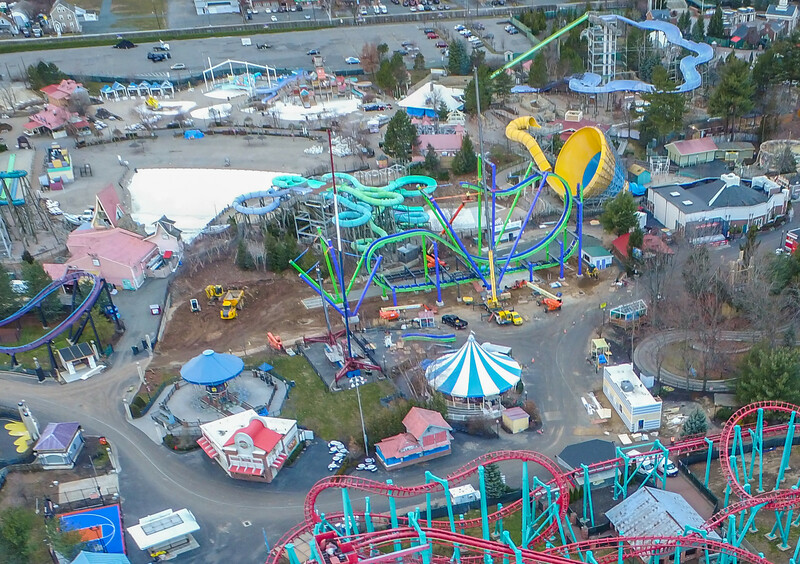 That was a huge indicator they were working on Mind Eraser, and as you will see further in the trip report, they were testing it as well. Here I do not see any blue fencing!!!! And I see a train as well, probably the blue train since the red one is in the employee parking lot. And I don’t see any here either! Hopefully they removed it. Here is the progress on the Joker. It is coming along nicely! Lots of construction was going on today. Here is all the track in the employee lot. Here is the employee parking lot. It seems like there is maybe what seems to be pieces of Flashbacks train, and Superman's train. OK! ENOUGH! NOW ONTO MIND ERASER!!! 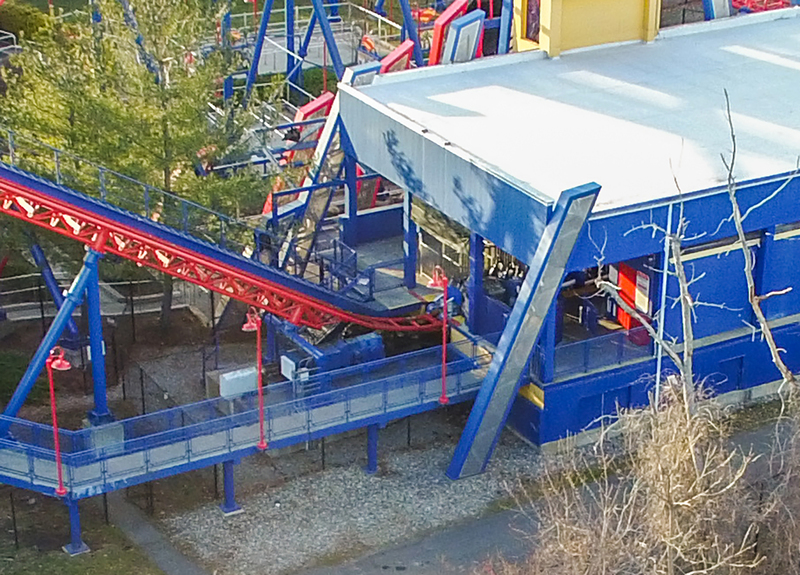 So here is an over head shot of the ride. You can see there is many vehicles around the ride, and at the exit of the ride. You can see some crates along that building there, but here is a train on the transfer track. I saw a red train that they were testing, and I saw this train on the transfer track, so it seems like they have two trains on the ride already. Another shot of the ride. And the best shot! 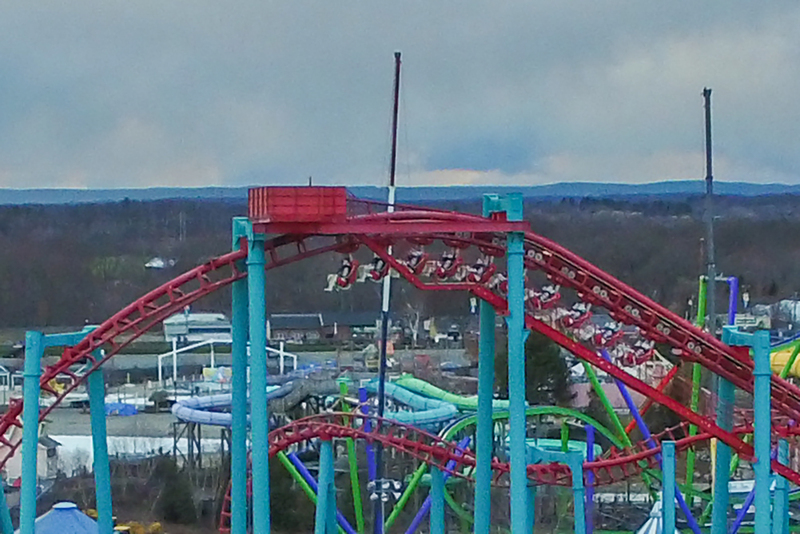 Here you can see the train on the track during testing! From what I can tell, these trains, or at least the restraints, are in fact different. I waited to post this picture because I didn’t want to call new trains and be wrong, but from what I can tell from what I saw and what I see in this picture, they look to be different trains, but feel free to post what you think. 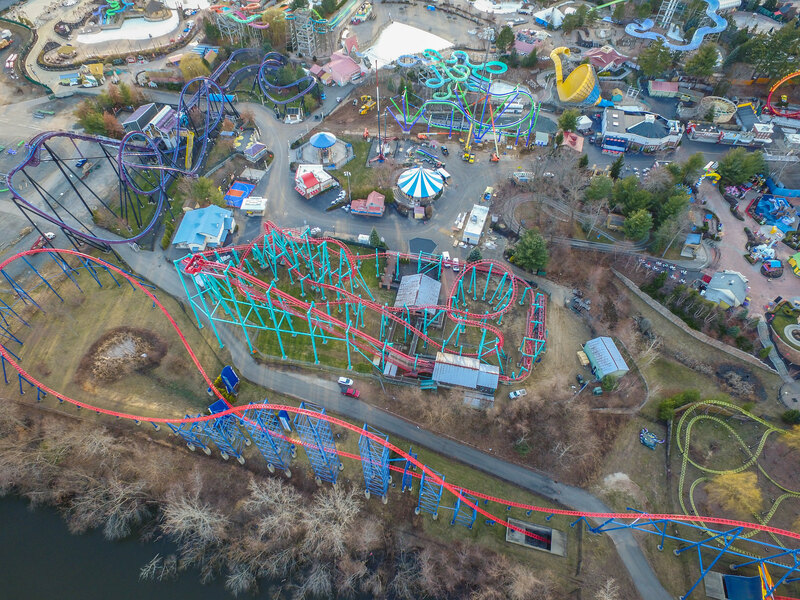 They tested Mind Eraser 75% into the drone shoot, pretty late, and I only saw them testing the red train, not the other one on the transfer track. 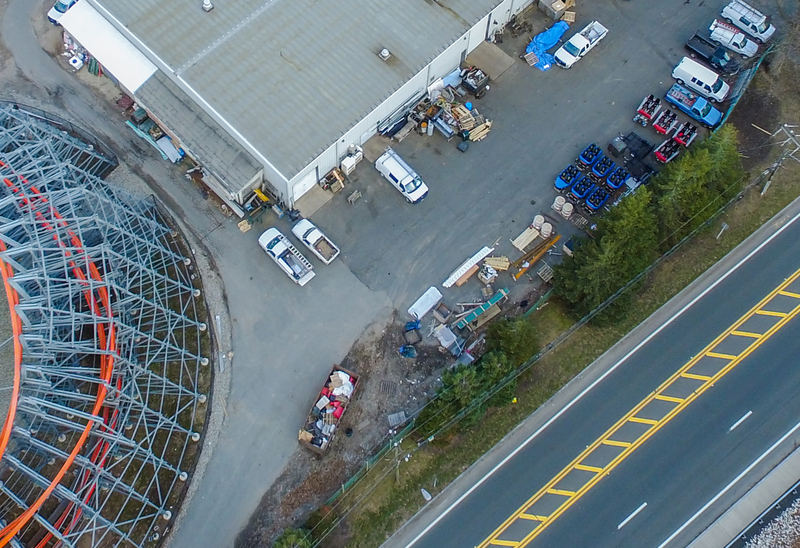 That concludes this drone update. 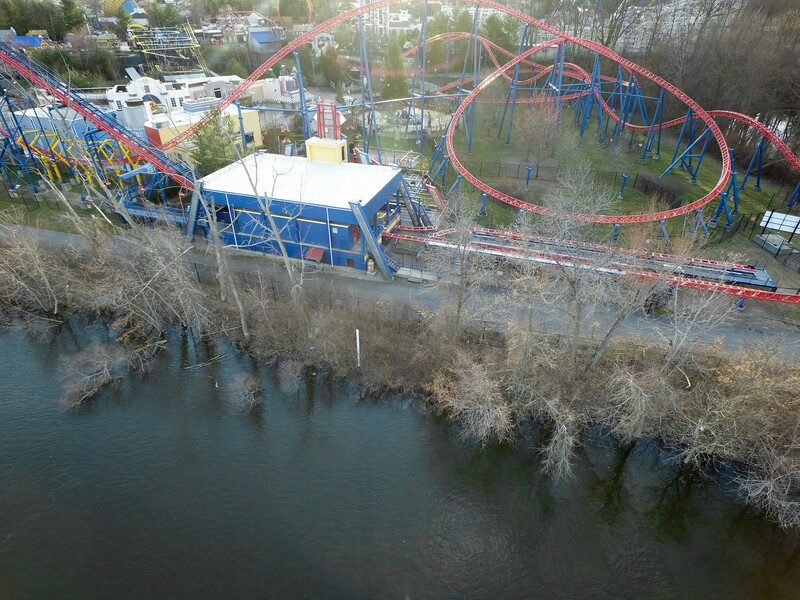 Nothing was going on around Wicked Cyclone or anything. 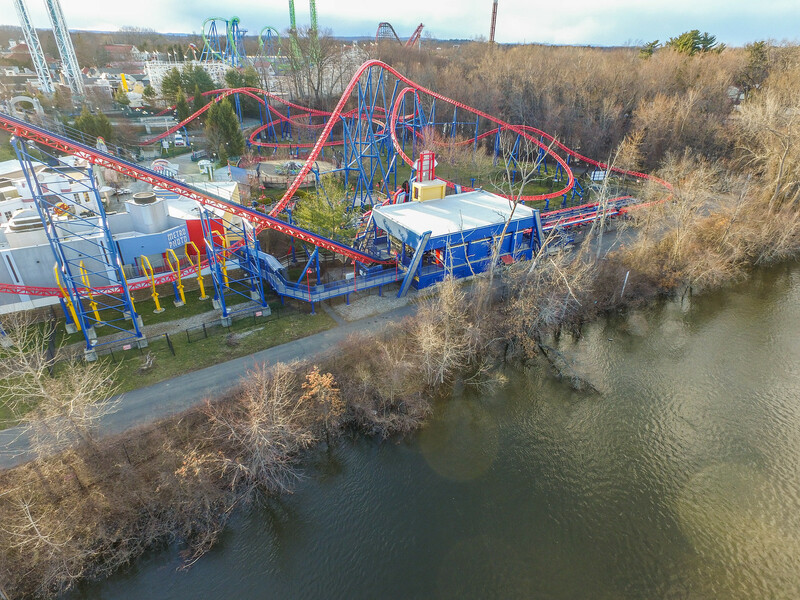 I have video of Mind Eraser testing from the drone and my phone, but I have to wait till I am home at my main computer to post it so it will either be posted tomorrow morning or tomorrow afternoon. I may go back next week with my good camera to try and get shots of the trains. Thank you for looking! Yay! Those are 100% new restraints! Awesome report! Awesome!! Definitely new trains. You can see the metal bar under each seat. Truly Awesome!!!! Thank you so much for getting the footage. Really hope it makes the ride smoother. I know people have been talking about a Harley Quinn retheme. I'm not a big super hero fan, what are the colors of Harley Quinn? If I'm seeing this, the other train doesn't look teal..
Harley Quinn is Black and Red primarily. But the Suicide Squad movie changed her appearance. 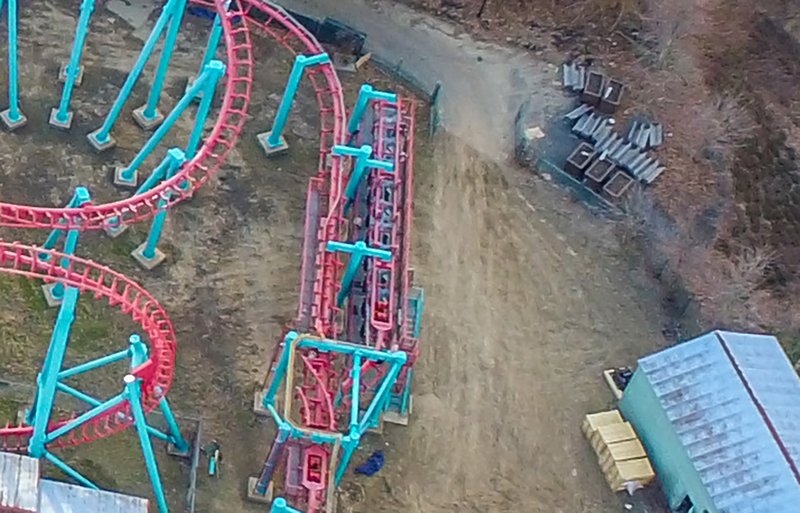 They could honestly leave the Track and just paint the supports grey if they do in fact re theme it. I love snooping around the pics looking for secrets. Kinda looks like the top part of CAC was paved but not positive. Also doesn't look like they started much work on the entrance. There's a few things in the dumpster by the superman red train that looked the same color, kinda thought it was the audio box but probably not. Awesome pics and i also like enlarging them to check things out. 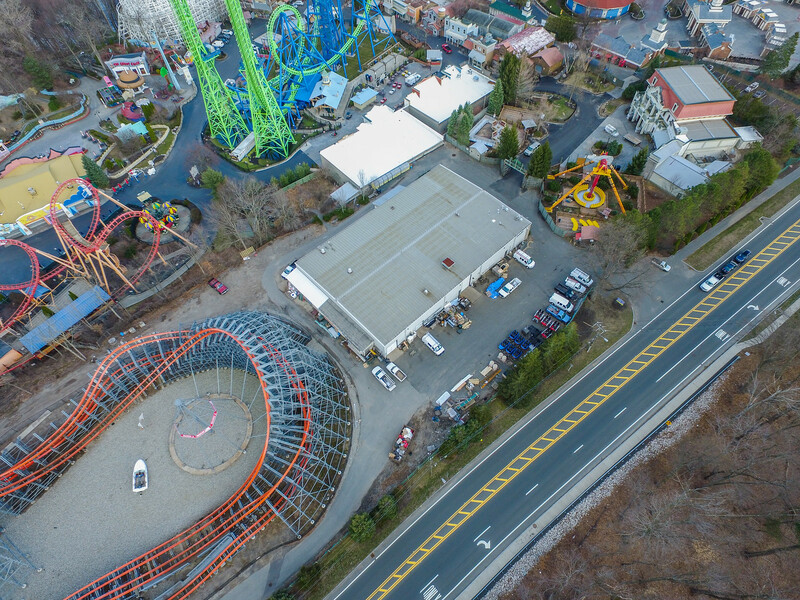 I love how sfne is doing the que much better then gradv just like with fireball. Looks like Batman got some love! I AM SO EXCITED FOR 2017!!!!!!!! I'm practically blind & looking at these pictures and trying to zoom in just makes everything blurry, but from what I can make out those restraints are definitely different. I'm pretty sure the train is too given all the evidence we have gathered. I am so happy and hopeful that ME will become a regular ride for me. I never really noticed how big the water park really is and thank god all the pools have been drained. 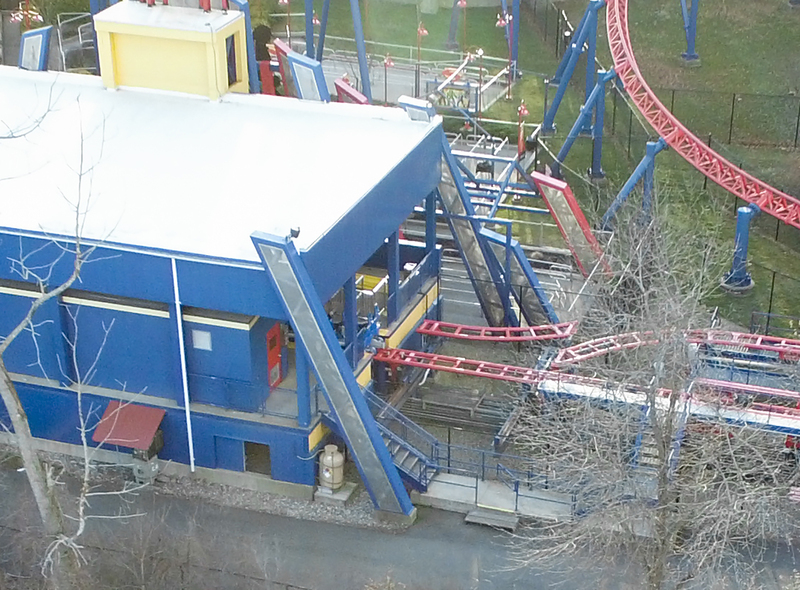 Superman's paint is holding up and these pictures makes it look even brighter than last years. Joker looks awesome! I love how it looks with the water park behind it. Also the new snack building looks good, hopefully they add seating around it. Thank you Dylan for getting this update for us. Please everyone keep this to ourselves, and do not ruin the announcement for the park!!!! 34 days and counting, 5 weeks from tomorrow morning! For those who didn't read the report above, please keep these pics off Facebook until after the announcement in 11 days! Not gonna lie, I'm more excited about the Mind Eraser news than the joker. So happy to see ME will be here for years to come!! I love snooping around the pics looking for secrets. Kinda looks like the top part of CAC was paved but not positive. They definitely paved all the way to the top. I think it looks awful and just half done. Let's hope they finish paving all of it and not just sections. It looks almost like new black fencing near the water feature too. Have to agree! We rode Joker at SFGADV and were not impressed. If the changes to ME will stop the head banging It could be an occasional ride coaster for us. 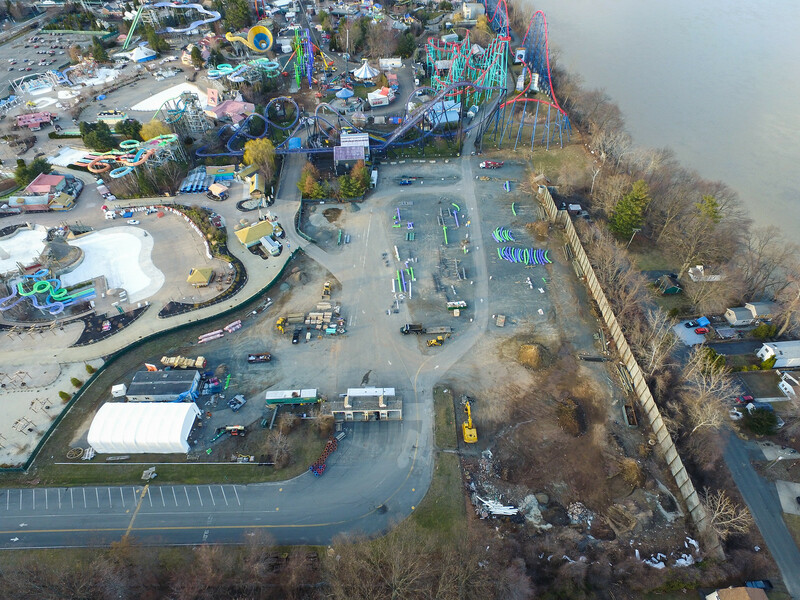 Sfne Off Season Aerial Update!